Not to be left out of the biometrics race, LG is apparently planning to equip the upcoming G4 flagship with a fingerprint scanner in its turn, cite industry sources. We've been hearing since the G3 that LG is mulling a finger sensor, but evidently the technology has reached enough critical mass now that Apple and Samsung are firmly onboard for LG to warrant the inclusion. LG had the extra Knock Code layer of security implemented in the G3, but in the world of Apple and Samsung Pay this might not be enough a year from now. Plus, embedding the fingerprint scanner in the home key at the back will allow for the company to try and achieve the same excellent screen-to-phone ratio it managed with the G3. on the back where the on/off and volume controls go. I think it would be great right where the on/off button currently is located. In fact make the on/off the scanner. Yes. I thought that too the moment i read the title. IMO that would be very bad experience because knock to wake up wont work. I've used LG G3 and its very convenient feature because power button at the back side. Nice to see Korean phones making a major comeback. This phone is gonna rock. What happened to Pantech? They've got impressive device before but doesn't expand beyond Korea, Japan, and US. Where Samsung leads, LG follows, but they do it with taste and style and put their own stamp on it. At first, I thought the rear buttons were atrocious. But with the G3, LG really improved on them and they look stunning. As does the entire device itself. I currently own G3, and I've to say it's a great phone. Imagine if they put all buttons and add a fingerprint sensor together on the back, it won't look so attractive in my opinion. You should be kicking yourself for buying an S4 period. That's rough. Are you stuck in it for two years? Why not Qualcomm's ultrasonic sensor? If qualcomm ultrasonic sensor is compatible with the 810 soc.why not use it..? The problem is you're licking the back buttons instead of clicking them. Your tongue must be brawlic by now. Ha! I got a good laugh out of that one, thanks. I rather have a brawlic tongue than a LG 3 shaped bun-hole. All that brown-nosing for naught.. I also want to add.. my G3 ran a bit sluggish despite having 2.5 ghz chip. There is always enough pause to make it less smooth than it should be. I even got rid of all the animation and unnecessary 'delay'. It doesn't feel like a 2.5 ghz chip. After the Android L update, it was a bit better, especially the camera. But still not impressed with the battery life at all, not much improvement with Lollipop. It is still a good phone, but not one of the best you can buy for top end. I have the G3 and the iPhone 6 plus and I like them both almost equally. I am trying to decide whether I want the iPhone 6S coming September or the G4. There's something about the way the iPhone feels. You can feel how well made they are and actually examine it to find it to be seamless and perfect. 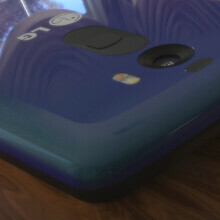 The G3 being plastic and having the removable back fails to have those qualities. I'd like to see a G4 that has a metal body and cut the sh*t with the removable battery. Give me a good one battery that keeps a charge and doesn't need to come out! I have to say that the way the G3 is shaped fits better I'm your hand so there should be plenty of room for a giant battery. As for iOS and Android Lolipop, I love them both and hate them both for obvious reasons. I think making the power button the scanner is a great idea. When holding the phone, my pointer finger lines up nicely with the power button and volume rocker.